Furniture arrangement is one of the hardest decisions to make in a room, but when it’s right, it’s perfect. If you take the time to create a great furniture arrangement to start with, you will never need to rearrange. Below are some tips for furniture arrangement for small rooms and large ones. 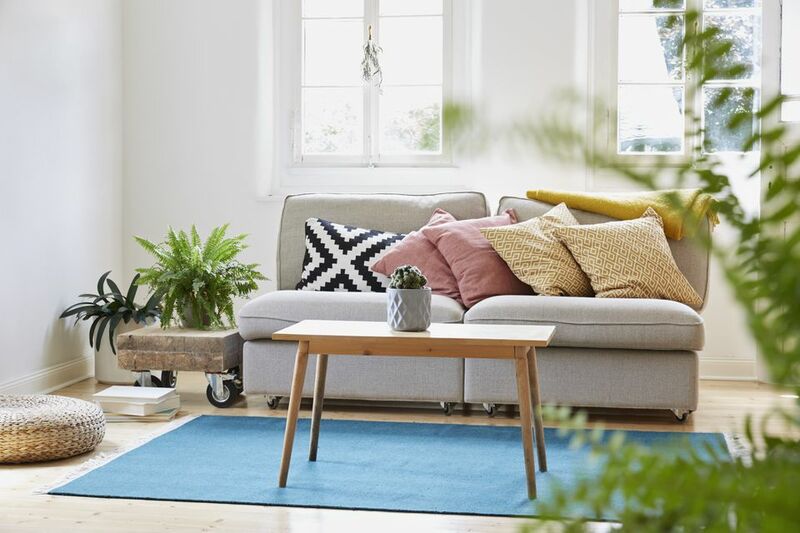 These furniture arrangement basics can help you create a room and a home that flows. In other words, completely empty the room, if possible. I know this can be hard, especially in a cramped, city apartment, but it is sometimes impossible to visualize a fresh new look unless you begin with a blank palette. Every room needs one. This is the defining element in your room. It can be a something as simple as a fireplace or a unique piece of furniture or artwork. Your furniture should be arranged to take advantage of your focal point. For example, in the living room or bedroom, the sofa or bed should face the focal point. In the living room, this would be your sofa; in the bedroom, your bed; and in the dining room, your table. This piece of furniture must be in the correct place before anything else will work. Use these tips for positioning your main piece of furniture. Identify traffic patterns and avoid setting up an obstacle course. For example, if you must cut through your dining room to get to your kitchen, you won’t want to dodge a huge table and chairs just to get a drink of water. Decide on the use of the room – intimate gatherings, entertaining large crowds, sleeping and playing (like in a child’s bedroom) or sleeping only? Your main piece, especially in a large room, will help define the purpose and use of the space. Don’t block doorways, windows or views to other rooms, if possible. Consider these factors before you begin moving your furniture in. This is very important in a large room, but it is just as important in a small space. The remaining furniture and decor should enhance and work around your main piece. If a smaller piece won’t fit or it won’t compliment these two factors in your room, it doesn’t belong in this space. Use these tips for positioning your smaller pieces. Again, consider traffic flow. You will constantly be bumping into these smaller pieces unless you place them well out of the walkway. Consider scale and proportion of your pieces and how they fit into the existing scale of your space. A too-small chair next to an overstuffed sofa often feels awkward; so does a tiny picture hanging on a large wall. When in doubt, go larger rather than smaller. Pull some furniture pieces out from the wall. This is a great way to define certain areas of a large room. It also keeps a small room from feeling like all of the furniture is squished against the wall. Go large with your rug. A too-small rug will just make your room appear smaller and will also feel awkward in the space. For a luxurious look, let your rug flow underneath furniture. The middle of your artwork should hang at eye level. Protect your shins and elbows. Coffee tables should be far enough away from the sofa for comfort, but close enough to use. The height of side tables should be at or below the arm of the sofa. Mix it up. Incorporate furniture with different heights and depths to add balance, contrast, and interest to your room. Add proper lighting. Think in layers – overhead (or ambient), task and accent – to create the perfect ambiance.